AcidAlkalineDiet.net is the home of the Acid Alkaline Association, a body which promotes the research and understanding of acidosis. Essentially, this website encourages users to try eating a different diet, which they believe will help to prevent (or even cure) cancer and other health conditions. The site provides recipes and an array of information for its users. This site is free to use and explore, providing data on bad food combinations, as well as an acid-alkaline food chart to help you identify foods which may be high acid-forming. The assumption is that many modern lifestyles and food choices lead to an unhealthy digestive system, and therefore body. The website looks at the acidity of foods as a way of determining their overall impact on your body’s ecosystem. 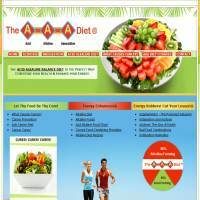 But we’re not here to explain the diet’s theories, rather to tell you about what’s available on Acid Alkaline Diet. The answer to this is, primarily, information. The website is really there to inform you rather than sell diet plans, although it does include links to other sites which offer AAA Diet Courses. These courses are offered by the University of Natural Health and the College of Natural Health. You can also find other helpful links here. In terms of recipes, the site offers meals based on their effects, rather than their ingredients. For example, you can find foods which are energy enhancers. There is also a “levels” system, which is based on the health, power, strength and endurance providing capabilities of any given meal. Broken down, these level diets include raw food, vegan and vegetarian foods, plus lacto and flesh cooked items. Recipes are a little vague and there are no pictures to accompany many of them. In addition, the site offers no shopping lists, so it’s quite hard to work out exactly what you’ll need to buy in a week. The diets seem to share similarities with raw food diets, where you eat a lot of fresh, uncooked fruits and vegetables, nuts and seeds. This website is free to use but it feels really underdeveloped. There’s a lot of speculation, general almost-information, but a real lack of precision in many areas. If you take a look around the site and decide to try the diet, you’ll probably have to spend some time reading through recipes and making a list of exactly what you’ll need and how long the food will take to prepare, as none of this is done for you. There are also no additional tools such as food diaries, weight logs or calculators, so you’ll need to keep a check (and decent records) on all of that yourself. Consequently, whether or not the diet is useful for your general health, the website isn’t great when it comes to helping you to track whether or not you’re losing any weight.